If you’re one of millions of people who don’t even think twice before popping a stick of gum in your mouth to freshen your breath, you may want to carry a toothbrush around after reading what it can do to your body. Confession: I am addicted to cinnamon chewing gum — and I have been pretty much since I was a gum-snapping high school student who probably tortured teachers with my ever-present Big Red scent. But right before I was assigned the task of finding out more about how gum affects your body, I noticed my stomach felt upset at certain points in the day, usually in the late afternoon, and I couldn’t pinpoint the culprit since my diet is healthy and I drink lots of water. Then, I realized it’s completely abnormal to go through a pack of gum every two days. Like, totally insane. So, I quit gum cold turkey, which hurt me on an emotional level because I’m sure I associate it with Britney Spears, body glitter and happiness. But, my stomach immediately felt 100 times better. What the heck? Aren’t the only negative affects of gum supposed to be that your teeth can fall out from it many, many, many years down the road? Nope. Three heath experts provided six solid reasons why the pleasure of chewing gum is not worth the harmful effects it can have on your body. Clinical nutritionist Stella Metsovas warns that ingesting saccharin, which is a key ingredient used to make gum, leads to a microbial imbalance, which disrupts all of the good bacteria in our stomachs that helps us digest our food and absorb nutrients. I wasn’t dreaming — my gum-chewing habit was the reason my tummy felt all funny. Um, thanks, but no thanks. Metsovas says the same saccharin that wreaks havoc in our gut also increases our glucose intolerance. “Glucose intolerance or hyperglycemia is often referred to as being ‘pre-diabetic,’ and many conditions, like sleep disorders, cardiovascular diseases, and Polycystic Ovarian Syndrome (PCOS), are strongly influenced by high glucose levels,” Metsovas said. Blame glucose intolerance again — Metsovas says it can lead to weight gain over time. 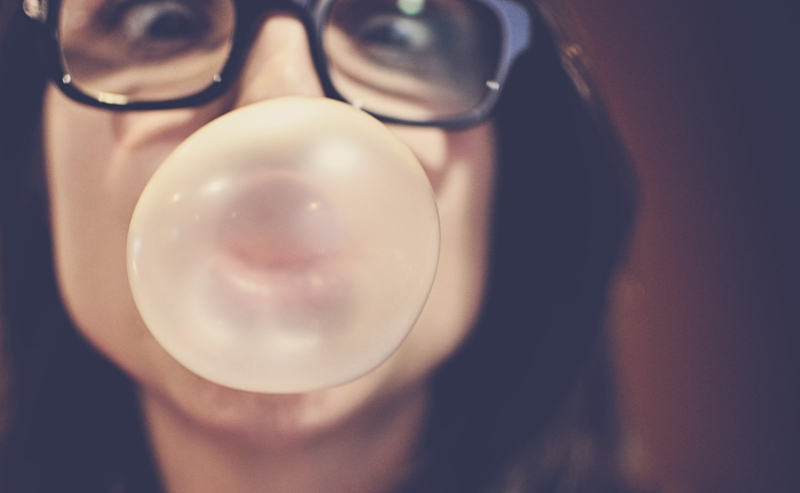 So much for our theory that chewing gum helps to keep us from snacking. Registered dietician and nutritionist Lily Nichols cautions us about something that seems obvious, but that we often ignore: The more of something you have, the more of it you want. When we get used to chewing on sweet peppermint or strawberry gum, a fresh strawberry isn’t going to cut it. We’re even more likely to opt for a sugary midday snack because our taste buds are used to overly saccharined artificial sweeteners. And too much sugar, as we know, leads to weight gain and other health issues. When we eat real sugars from carbs, our bodies release hormones, some of which are called “satiety peptides,” Nichols says. But, studies have shown that the body is no fool when it comes to the artificial sweeteners in gum and gets revenge on us by refusing to release those peptides. More proof that gum does not keep us from eating or help with weight loss. Dr. Elizabeth Trattner, A.P., D.O.M., whose focus is nutritional counseling, says gum is just one of many things in the Western diet that bears zero resemblance to what it was thousands of years ago — when gums were made from natural substances like grasses, resins and plants. And always, always read your labels. Are natural sweeteners a better choice? GMO vs. GE foods: What’s the difference?